Counted Cross Stitch Kit with Chart, Embroidery Fabric: 100% cotton, Yarn: 100% cotton DMC, 7 stitches/cm - 18 count, Yarn organizer, Instruction in four/ eight languages, Large-square charted design, Needle, Frontsheet picture, ca. 19 x 16 cm / 7.6" x 6.4", Age category: from 10 years, Stitches: cross stitch, back stitch.. Counted Cross Stitch Kit with Chart, Embroidery Fabric: 100% cotton, Yarn: 100% cotton DMC, 5,4 stitches/cm - 14 count, Yarn organizer, Instruction in four/ eight languages, Large-square charted design, Needle, Frontsheet picture, ca. 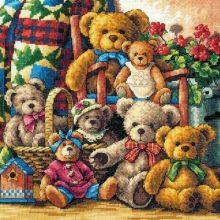 27 x 22 cm / 10.8" x 8.8", Age category: from 9 years, Stitches: cross stitch, back stitch.. Counted Cross Stitch Kit with Chart, Embroidery Fabric: 100% cotton, Yarn: 100% cotton DMC, 6,4 stitches/cm - 16 count, Yarn organizer, Instruction in four/ eight languages, Large-square charted design, Needle, Frontsheet picture, With Alphabet and Golden Heart, ca. 16 x 18 cm / 6.4" x 7.2", Age category: from 12 years, Stitches: cross stitch, long stitch, back stitch.. Counted Cross Stitch Kit with Chart, Embroidery Fabric: 100% cotton, Yarn: 100% cotton DMC, 5,4 stitches/cm - 14 count, Yarn organizer, Instruction in four/ eight languages, Large-square charted design, Needle, Frontsheet picture, With alphabet, ca. 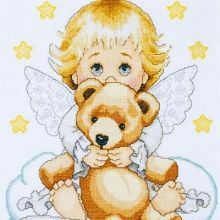 26 x 26 cm / 10.4" x 10.4", Age category: from 9 years, Stitches: cross stitch, back stitch..
Bear with Bouquet has those sweet lovable eyes that you just can't pass up. With a bouquet of flowers in his arms he is sure to win everyone over. Contains: 14-Count Aida Fabric, 6- Strand 100% Cotton Floss, Needle, Graph and Instructions. Size 5" x 7".. Counted Cross Stitch Kit with Chart, Embroidery Fabric: 100% cotton, Yarn: 100% cotton DMC, 5,4 stitches/cm - 14 count, Yarn organizer, Instruction in four/ eight languages, Large-square charted design, Needle, Frontsheet picture, ca. 32 x 29 cm / 12.8" x 11.6", Age category: from 9 years, Stitches: cross stitch, back stitch..